Blind human rights activist, and self-taught lawyer, Chen Guangcheng, gives an extraordinary interview here with the British broadcaster Matthew Bannister, detailing his very dramatic escape from China to the U.S., as well as his difficult childhood as part of a misunderstood and mistreated disabled community, where he first began speaking out to demand change. 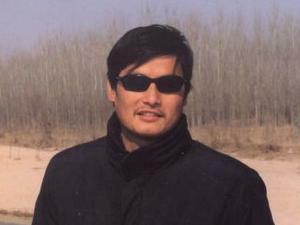 Chen Guangcheng, frequently described as a “barefoot lawyer” who advocates for women’s rights, land rights, and the welfare of the poor. Although many of the facts of Chen Guangcheng’s life are widely known, this interview with Matthew Bannister provides an opportunity to hear Chen speak about his remarkable journey to freedom and the steep challenges he faced, at first, as a disabled person attending school for the first time at the age of 18, and his path thereafter to becoming the human rights activist he is now famous for. It was at the Elementary School for the Blind in China’s Linyi city, which Chen began attending in 1989 at the age of 18, where Chen learned Braille and to read books. Chen recalls the students were never allowed outside due to safety concerns; the school lacked fans in summer and heat during winter, and the school’s cook served students poorly made meals deliberately because they were told the disabled did not deserve better. One of Chen’s earliest protests was to gain the right to go out of doors. He argued that although the school did not want to take responsibility for the students’ safety beyond its walls, Chen countered that they should worry more “about our futures” and being able to live independently in order to return to society. He also demanded school staff, including the cook, do their jobs properly and treat students like anyone else. This attitude toward the disabled followed Chen to the Nanjing University of Traditional Chinese Medicine, when he enrolled there in 1998. Chen remembers the time as one of poverty and poor health. “China did have a law to protect disabled people but it wasn’t implemented so a lot of basic rights were often violated,” he said. Through his interest in short wave radio, Chen learned of an activist who would later send him money for food. However, the deed attracted the attention of the authorities who forced Chen to hand over the money he received and further demanded he do so ‘voluntarily’. One of the most striking currents throughout Chen’s narrative is his belief that persistence in the face of difficulty will triumph.